Following a period of financial prosperity and critical adoration, Disney released Pocahontas to disappointing box office and critical reception. Artists and storytellers at Disney expected their biggest hit yet, but it wasn’t to be. Pocahontas tells the fictionalized account of the Powhatan chief’s daughter Matoaka and her brush with the English Jamestown settlers. One important aspect of this film is that it’s the second animated Disney movie to explore a historical figure, barring mythical ones such as Robin Hood. The first was Sword in the Stone of course, a fictional account of King Arthur. The difference here is that we only really know legends of Arthur; that’s all that remains of a king who existed centuries ago. However, there are history books containing the true story of Pocahontas and countless historians have written their theses on her. Disney wasn’t the first to romanticize her tragic life, but their telling is perhaps the most well known. Strangely enough, the direct-to-video sequel Journey to a New World tries to amend some of the original film’s inaccuracy. It also handles its characters better and offers something new: a Disney Princess who has two love interests. The real daughter of the Powhatan chief was named Matoaka, and when she moved to England she was renamed Rebecca. Pocahontas is a pet name that means, roughly, naughty one. She was about 11 when she met John Smith, who had little in common with Mel Gibson’s animated hero. She married John Rolfe, moved to England, had a son and died after three years. With all of that being said, lots of films show a rosier picture of bleak real-world events. 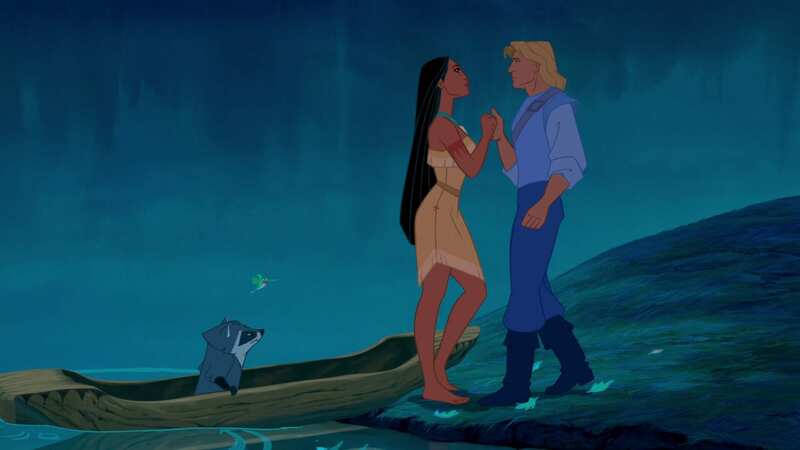 Pocahontas is both an adaptation of a true story and a piece of art to be viewed as such. So, how does it fare? Pocahontas has beautiful animation and music. Glen Keane created one of Disney’s most unique character designs with the title Princess. Broadway actress Judy Kuhn provides the singing voice of Pocahontas and man, this lady is a powerhouse; her voice also blends well with speaking voice Irene Bedard. However, the characters in this film are terrible. The plot is boring and despite being a short movie, this sucker drags, particularly in the middle. Our lead has no discernible traits other than being described by Kekata as “headstrong.” She’s pretty, but strange looking; too much work was put into making her exotic and not enough into her personality. John Smith is handsome and adventurous, but that’s it. Pocahontas says Kocoum is too serious for her, but how is John any different? Pocahontas is the first Disney Princess to have a human female friend (the closest prior was Ariel with her sisters, but they’re related and hardly interact), however Nakoma suffers the same fate as all of this film’s protagonists: boring, no personality, no motivation. The only character in Pocahontas with a personality is Ratcliffe. This is another character who really existed, and the filmmakers arbitrarily decided to have him be evil. His motivations are greed and racism, but greed is boring and the racism aspect is blunt and not handled well at all. Next week I’ll be talking about a more interesting racist villain in The Hunchback of Notre Dame. Ratcliffe brings me to another point: Pocahontas portrays the English as greedy and arrogant. I don’t find this fair at all, as Ratcliffe and the other settlers essentially starved and suffered in the new world. The film also portrays the natives as superstitious and ignorant; good grief, Pocahontas’ mentor is a tree! A talking tree! I’ll give credit where it’s due: the animal friends don’t talk. That’s a plus. Pocahontas has good intentions and thinks it has a lot to say, but by the end they’ve made both sides look stupid and failed to garner sympathy for any of the characters or their situation. My favorite part is “Just Around the Riverbend,” and a definite low point is any scene with Ratcliffe, as well as the scene where Thomas kills Kocoum. Disney was likely trying to capture the drama of Mufasa’s death, but failed miserably.